Ever tried looking at the sun with your bare eyes? Too bright, right? Now imagine looking at something with the brightness of 300 trillion suns. 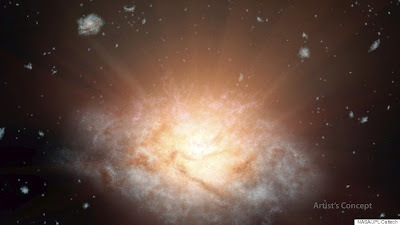 That's how intense "the most luminous galaxy found to date" is, so much so that NASA has created a new classification for it and the 19 other similar galaxies it has discovered: extremely luminous infrared galaxies, or ELIRGs. Scientists have recently spotted the ELIRGs in infrared images of the sky taken by the agency's Wide-field Infrared Survey Explorer (WISE) space telescope in 2010. This particular one is located 12.5 billion light years away, which means it started forming soon after the universe was born 13.8 billion years ago. As for why it's so incredibly brilliant, NASA JPL scientist Chao-Wei Tsai says it "may be from the main growth spurt of the galaxy's black hole." See, some galaxies have supermassive black holes in the center that actively absorb gas, dust and other matter that form a disc around them. These discs radiate a ton of energy and make the black holes look brighter than stars. Some black holes are a lot more ravenous than others, though, attracting more matter than their less voracious counterparts and, as such, are several degrees more luminous and massive. To wit: the bigger the black hole, the larger the disc and the brighter the whole galaxy. There are several possible reasons why the black hole in this record breaker is so huge. According to the scientists' paper, it could have just been born big, so it's only natural for it to consume more food than usual. We might also just be seeing a period in its life -- remember, the light WISE spotted was from 12.5 billion light years ago! -- when it was bending the limit of black hole feeding. Finally, it might not be spinning as fast as other black holes, which allows it to go on a sustained binge eating, so to speak. One of the paper's co-authors, Andrew Blain, describes it as "winning a hot-dog-eating contest lasting hundreds of millions of years." You'd have a tough time eating hot dogs while whirling very, very fast, after all.